Ome­gaT inclu­des all func­tions of a CAT pro­gram — two-part seg­ment dis­play for text trans­mis­si­on to the tar­get lan­guage and trans­la­ti­on memo­ry seg­ment sto­rage. For­mat­ted text files con­tain infor­ma­ti­on such as font type, size, color, etc. as well as the actu­al text. By obser­ving exis­ting for­mat tags Ome­gaT allows the­se for­mat infor­ma­ti­on to be pre­ser­ved while trans­la­ting the source text into the tar­get text. This allows docu­ments such as Open­Of­fice or Micro­soft Office for­ma­ted files to be edi­ted direc­t­ly by using Ome­gaT. Ome­gaT sup­ports a lar­ge num­ber of dif­fe­rent file for­mats, wher­e­by we work by default with the file for­mats shown on the right. If your text docu­ment is not avail­ab­le in a for­mat listed on the right plea­se con­tact us to cla­ri­fy whe­ther a trans­la­ti­on of your text using Ome­gaT is pos­si­ble. Stan­dard Text Datei Endung txt im Uni­code Zei­chen­satz For­mat. Open­Of­fice Datei Endung odt, ods, odp (Wri­ter, Calc, Impress). Micro­soft Datei ab Office 2007 Endung docx, xlsx, pptx (Word, Excel, Power­point). Ome­gaT splits the source text into socal­led seg­ments (sen­ten­ces or logi­cal text units such as hea­dings, bul­le­ted lists, etc.) and dis­plays them for trans­la­ti­on. On the left an examp­le of this seg­men­ta­ti­on is shown: Ome­gaT has iden­ti­fied the sen­tence “Auch ein Affe fällt mal vom Baum.” wit­hin the source text, The text con­sists of a sen­tence ended by a full stop and is thus trea­ted by Ome­gaT as a seg­ment. Trans­la­ti­ons are stored by Ome­gaT in a TM file and used for the trans­la­ti­on of sub­se­quent repe­ti­ti­ons. It reco­gni­zes whe­ther it is an iden­ti­cal repe­ti­ti­on or only part­ly iden­ti­cal (Match pro­ba­bi­li­ty) with a seg­ment being trans­la­ted wit­hin a pre­vious trans­la­ti­on job. Ome­gaT dis­tin­guis­hes bet­ween an inter­nal TM that deli­vers Repe­ti­ti­on Matches and an exter­nal TM that deli­vers Match pro­ba­bi­li­ties bet­ween 50 and 100 per­cent. An inter­nal TM is the TM used for the cur­rent trans­la­ti­on, who­se Matches are auto­ma­ti­cal­ly inser­ted in trans­la­ti­ons as the­se were done by the trans­la­tor for exac­t­ly this source text trans­la­ti­on. Matches from exter­nal TMs (for examp­le, from ear­lier source text ver­si­ons) are offe­red as sug­ges­ti­ons for trans­la­ti­on. 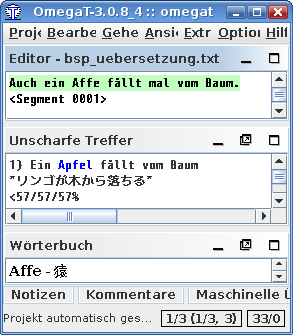 An examp­le of the func­tion of TM files can be seen in the figu­re above: At the Unschar­fe Tref­fer menue Ome­gaT shows for the source text “Auch ein Affe fällt mal vom Baum.” the TM Match “Ein Apfel fällt vom Baum.” found in an exter­nal TM. This Match is 57% con­sis­tent with the source code. In addi­ti­on to the glossa­ry func­tion Ome­gaT allows the use of elec­tro­nic dic­tio­n­a­ries. In addi­ti­on, the inte­gra­ti­on of online dic­tio­n­a­ries such as Goog­le Trans­la­te or Micro­soft Trans­la­tor is pos­si­ble. The illus­tra­ti­on above shows an examp­le of using Ome­gaT Dic­tion­a­ry func­tion: In the Ome­gaT pro­gram dic­tion­a­ry area you can see that for the word “mon­key” in the seg­ment cur­r­ent­ly being edi­ted by the trans­la­tor the term “猿” was found by Ome­gaT. At the same time the spel­ling che­cker func­tion in Ome­gaT enab­les the detec­tion and cor­rec­tion of spel­ling mista­kes. Fur­ther­mo­re the Soft­ware Lan­guage Tool has been inte­gra­ted into Ome­gaT as an addi­tio­nal fea­ture, which is able to detect simp­le gram­ma­ti­cal and syn­tac­tic errors.